Nigel Harrett, the new principal of Northumberland College. 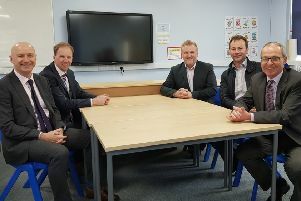 Nigel Harrett will take over the helm at Northumberland College and lead it into an ambitious new phase following its merger with Sunderland College last week. Nigel, who was previously deputy principal and deputy chief executive of Sunderland College and lives in Ponteland, was appointed by the board of governors following a rigorous selection process. Rob Lawson, chairman of governors, said: “We are delighted to announce the appointment of Nigel Harrett as the new principal of Northumberland College. Following a successful merger with Hartlepool Sixth Form College, Sunderland College was selected as a merger partner by Northumberland College. The new group of colleges officially formed last week as Education Partnership North East, will create one of the largest academic, professional and technical education colleges in the country. Chief executive Ellen Thinnesen said: “Throughout his time at Sunderland College, Nigel made a significant contribution to the college’s success in transforming lives, improving the student experience and ensuring an innovative curriculum. Nigel started working at Sunderland College in 1989 as a lecturer of business and accountancy. He originally began his career working for the Newcastle and Gateshead Water Company with an ambition to becoming an accountant. However, his desire to make a difference to young people and communities led him to combine the two by teaching accounting and business. He progressed through the ranks, during his 30-year career at Sunderland College, to deputy principal and deputy chief executive with overall responsibility for curriculum and quality management. He said the highlight of his career is results day, as he enjoys seeing so many young people with so many aspirations, making their ambitions a reality. Assessment, said: “I am very excited to be joining Northumberland College as their new principal at such a pivotal point in the history of the college. "It will be an honour to lead the college into the next ambitious stage of its growth and development. “I am inspired by innovation and passionate about the strong values at Sunderland College and I am looking forward to embedding these into the culture at Northumberland. Nigel began his new role at Northumberland College this week, replacing previous principal Ian Clinton.